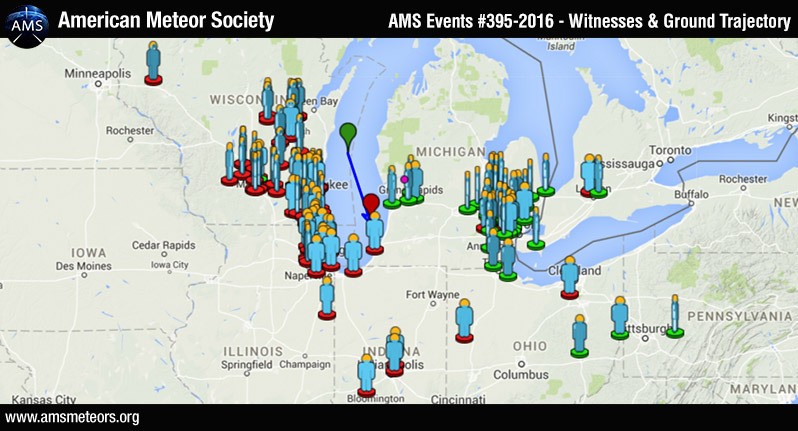 More than 200 witnesses have reported a large Earth-grazing fireball over Wisconsin and Michigan on February 1th around 6:25pm ET (February 2nd 2016 ~ 00:25 Universal Time). The fireball was seen primarily from Wisconsin and Michigan but witnesses from Ilinois, Ohio, Indiana, Pennsylvania and Ontario (Canada) also reported seeing the fireball. The fireball appears to be an Earth-grazer: a very bright meteor that enters Earth’s atmosphere and leaves again. Saw a very large fireball or comet. Lime green and larger then any of the fireball videos on this site. Close to earth to the west. 10:20pmish central time in Waunakee, wi near Madison, WI on 4/14/16. What was your exact location when you saw the meteor pass you by? Please give us your exact sighting location by State, City, Town, Township, and the nearest major and minor cross roads, down to your exact sighting location, down to the nearest cross streets? At exactly what time and date at your local time did you see the meteor or fireball? Did you HEAR ANYTHING unusual when the meteor passed you by? ANYTHING at all that may have been out of the ordinary at all, such as a roaring, a sonic boom, a hissing sound, a crackling sound, Etc…? WHAT DIRECTION was the meteor traveling from and to, this is VERY IMPORTANT? As an example, exactly East to West, or North East to South West, Etc…? How high in the sky was the meteor or fireball when it appeared and disappeared, if you were to use the face of a clock’s numbers as a guide? If you extended your arm out, at what O’Clock did it appear at and disappear at? As an example, it appeared at 10:00 O’Clock and it disappeared at the 2:00 O’Clock position? With your arm extended and sticking your thumb out as a guide, what size was the fireball or meteor as compared to the size of your thumb? What size would it appear to be as compared to the full moon, a planet like Venus which you can sometimes spot setting in the Westerly night Sky Just after sunset in the summer, or a large bright star? What color did it appear to be to you? What brightness did it appear to be to you compared to a full moon, Venus Setting, a bright star, Etc…? The more detail that you can provide me with the better we will be able to identify the object that you saw. I would appreciate any facts that you can provide me with. I am trying to identify weather or not this thing has appeared in the past, and weather or not it may re-appear and eventually break up or hit the earth, and it’s size, speed, and exact direction. I have seen something exactly like this in the past (1972, 1973, or maybe 1974), and I am trying to find out if this is the same object that has visited us before in the past. I forgot to ask you one more very important thing. If you faced directly East, West, North, or South, when you had your sighting of a meteor or earth grazing fireball, how high in the sky was the meteor of fireball relative to your sighting position, if you used the face and numbers of a clock as a guide? This can help us gauge how high and how far away it may have been from you as it passed you by, relative to your exact position, and to the curvature of the earth’s horizon, based on how far a person can see away from them to the horizon.